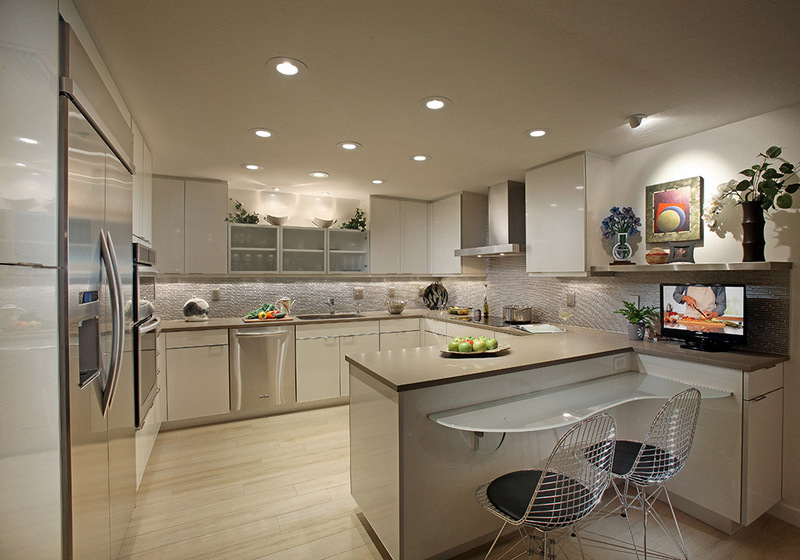 Description: This contemporary kitchen features the “Como” door style by Artcraft Kitchens. The doors and drawers are finished in “Figured Pearl Gloss” laminate with an aluminum profiled edge. The counter tops are “Mocha” by Caesarstone with a glass tile back splash. The refrigerator is a 42” built-in by KitchenAid as are the ovens, dishwasher and induction cook top. The hood is by Faber. Aluminum framed glass door cabinets are the focal point as you enter the kitchen and the full height, aluminum door appliance garage hides all the appliances the client wanted hidden (notice the exposed KitchenAid, stainless steel mixer on the counter). The frosted glass, floating snack table provides convenient eating space for two and the stainless steel shelf over the t.v. provides an attractive display area.